Victoria, B.C. – Joseph Tran, from Victoria’s Inn at Laurel Point, won the gold medal and the Fulgence Charpentier Trophy at the 2017 La Chaîne des Rôtisseurs Jeunes Chefs (Young Chefs) Rôtisseurs Competition held in Ottawa, ON on October 27th. The silver medal was presented to Vancouver’s Nathan Sundeen from Boulevards Kitchen & Oyster Bar. The bronze medallist was Calgary’s David Ryc from The Fairmont Banff Springs. Winnipeg’s Darnell Banman from the St. Charles Golf Country Club was recognized for having the highest kitchen score and received the Chef Paul Mastalir Award for Kitchen Excellence along with a Wüsthof Knife attaché set. As the winner of La Chaîne des Rôtisseurs’ 2017 Regional Jeunes Chefs Rôtisseurs competition, Joseph will now go on to represent Canada at the 42nd Annual Concours International des Jeunes Chefs Rôtisseurs, to be held in Taiwan in September 2018. At 25 years of age, Joseph has already been cooking for a decade, he started in his father’s restaurant in London, Ontario as a dishwasher and his hard work brought him to the line. Food has always been an important part of Tran’s life, and although slim in build, he loves to eat! His favourite meals are home-made dishes, such as a vermicelli bowl with spring rolls and, originating from Vietnam, his background has significantly influenced his style of cooking. Playing with flavour and texture profiles has his dishes dancing between sweet and sour, and crispy and chewy, each bite a surprise to the senses. After realizing his passion for cooking, Tran took culinary skills and culinary management at Fanshawe College in London, Ontario in 2013. After graduating, Joseph began working in a local hotel restaurant. Tran’s talent was quickly recognized by his Chef in London, who suggested that Tran be mentored by Chef Takashi Ito of Inn at Laurel Point in Victoria, B.C. Chef Ito travelled from Victoria to interview Tran and recognizing the potential in this young cook, hired Joseph to work at AURA waterfront restaurant + patio, Inn at Laurel Point’s acclaimed restaurant. In his two years at AURA, Tran’s dedication and zeal has resulted in his rapid rise up the culinary ladder to his current position as first cook. Although Joseph is quiet and humble, his personality and talent are anything but as he constantly experiments with new dishes and combinations. Always looking to improve, Tran observes his surroundings and regularly asks questions, leaving no stone unturned. He has even taken his work home with him, creating a professional kitchen of his own, complete with a deep fryer. This bright young man started competing while he was in culinary school, and thrived in the competitive environment. Most notably Tran has taken second place in a national cooking competition, and first place in B.C. Iron Chef, he says it is the thrill and the rush that attracts him to compete. His calm demeanor may make him seem like a dark horse, but he is a force to be reckoned with. 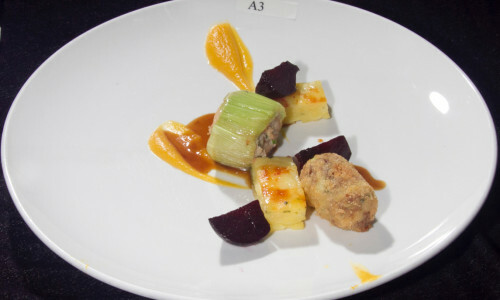 To prepare for La Chaîne des Rôtisseurs Jeunes Chefs competition, Tran says he broke all the principals down, practicing each component on its own. Noting that no matter how much you practice, when it comes to the black box, you have no idea what you will be working with – an element he loves. Practicing for his latest competition was a group effort, led by Executive Chef Takashi Ito, and supported by the culinary team at Inn at Laurel Point. In order to prepare Tran for this high-level competition, Chef Ito called upon other local Chaîne des Rôtisseurs member Chefs in Victoria, who graciously allowed Tran to practice in their kitchens, so he was equally prepared a variety of ingredients and cooking environments. One ingredient, however, will always be a challenge for Tran, as he has a severe shellfish allergy. When using the ingredient, Tran says he wears layers of gloves, and takes extra care. Joseph has become an expert at blind seasoning seafood, since he cannot actually taste a dish containing it. His expertise was noted during the competition when he prepared a marbled scallop and sea bass mousse dyed with squid ink for his appetizer. 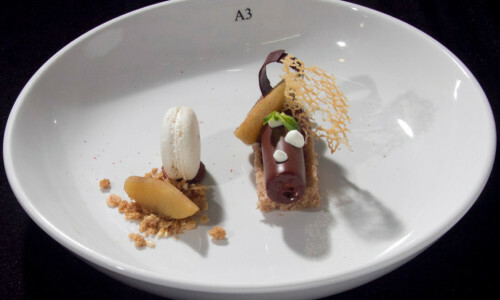 However, Tran’s aptitude for desserts sets him apart from many competitors. In his last three competitions, his desserts have been his strongest dish. Tran’s diverse skillset makes it hard to believe he is only 25-years-old. For Tran, it is his love of creating, curiosity and passion for learning that drives him to excel in all areas of the kitchen. The Chaîne des Rôtisseurs is an international gastronomic society devoted to promoting fine dining and preserving the camaraderie and pleasures of the table. The society has both non-professional “gastronome” and culinary professional members in more than 75 countries around the world.